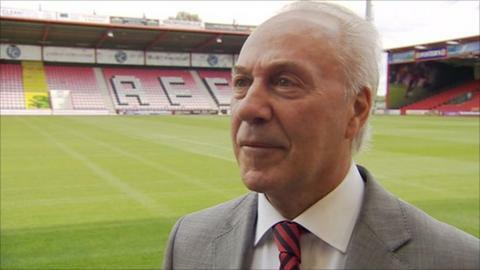 Bournemouth chairman Jeff Mostyn says he is hopeful that Championship clubs will be able to change the rules of Financial Fair Play in time for their first assessment in December. Mostyn says under the current structure the club would struggle to come inside the limitations when they get audited. Last week, the club revealed a £15.3m loss for the 2012-13 promotion season. "We are trying to have the boundaries of financial fair play extended," Mostyn told BBC Radio Solent. FFP rules are designed to ensure clubs break even over a three-year period and have come into full effect this season. Clubs which fail to comply with Uefa's new FFP rules could face player bans and points deductions. The regulations take effect this season and permit losses in the Premier League of up to 45m euros (£37.5m) over a three-year period, with the aim of eventually breaking even. Regulations vary from league to league and can also involve salary caps. The maximum permitted loss in the Championship is currently £8m for the 2013-14 season, or £3m if an owner does not inject equity. But Mostyn says the Cherries and other Championship clubs are trying to have the boundaries extended to set more realistic limits. "When you consider the current limitations were decided by a group of people who are no longer playing in the Championship," he said. "There are only about 40% of the clubs playing in the Championship that had anything to do with those regulations and it was prior to the huge parachute payments deal. What is wrong with having an owner who is determined to put his own money into a football club and take it as far as he can? "Everyone recognises with clubs coming into the Championship, with a first-season £23m parachute payment, something has to be done. "Hopefully, Championship clubs can agree to lift the limit and if that is the case, I think most people will be compliant or there and thereabouts. "We will do our utmost to be as close as we possibly can, but that is partly out of our control unless there are changes." Mostyn has also defended the loss of over £15m that the club recently posted, saying they were in a lot better financial health than other clubs. He also defended their reliance on owner Maxim Demin - the Russian petrochemicals billionaire. "If you look at QPR and the figures they posted was something like £70m," he said. "Their wage bill was more than Atletico Madrid. Fifteen teams in the Premier League are all losing money. "Debt is debt but we don't owe anyone outside of the football club any money. That has got to be the first time in this club's history. "What we have is an ambitious owner who has a desire to take this club as far forward as he possibly can. "We are all supporting him as much as we can by maximising our income commercially but, with a stadium that holds 11,700, it is always going to be difficult. "But what is wrong with having an owner who is determined to put his own money into a football club and take it as far as he can? "This club has never been in better hands and I am confident we will one day get into the promised land and that money can be repaid." Mostyn also says another season of success in the Championship will eventually lead to questions over their future at the Goldsands Stadium. The ground is currently leased while further expansion of the site could prove difficult. "We have to be sensible," he said. "Do we want to buy back a ground that leaves very little room for extension? "The economics of what we pay by rent is extremely appealing to Maxim and the board. We are not being overcharged. "What we need to do is keep our options open. If we can improve next season then we need to have a serious look at what we can do in terms of expanding the existing stadium with the support of the council, or ultimately there may have to be another alternative."